Still overweight, cuddly and clueless, Po (again, an endearing voice over by Jack Black) and the furious five face a new challenge from an evil white Peacock Shen (Gary Oldman), who is hell-bent on conquering China and destroying Kung Fu forever. The bringing in of 3D, adds leverage to the action sequences, and the consistent humour keeps the proceedings breezy. In 90-odd minutes, the sequel is a whirlwind ride, here we must thank the writers who ensure the gags keep coming. The voice overs are all spot on and the animation top class, if the film lacks anything, it is a little bit of heart, which the first one had ample servings of. 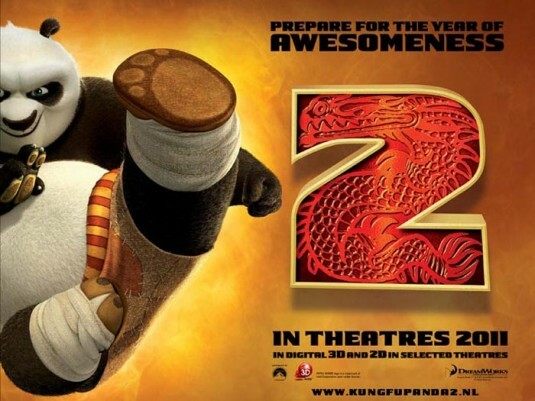 This is a minor quibble, for all through Kung Fu Panda 2 there is hardly any loose end. Go for it, though 3D does add to the viewing experience, 2D viewing should be enjoyable too.